It was my Dad’s 73rd birthday, ten days after the death of my father-in-law. I planned to call my Dad when I got home from the gym and have a nice long chat with him while my children were in school. But the day did not go as planned. I never made it to the gym, while driving there a special alert came on the radio. A plane had flown into the World Trade Tower. I turned my car around and went home. I grew up in New Jersey. My entire family, except for one cousin, lived in the metropolitan New York City area. So many worked and lived in Manhattan. I was a little scared. My sister worked near to the Towers, and that was where her subway station was located. It was about 9:40 am NY time. And I needed to hear her voice. 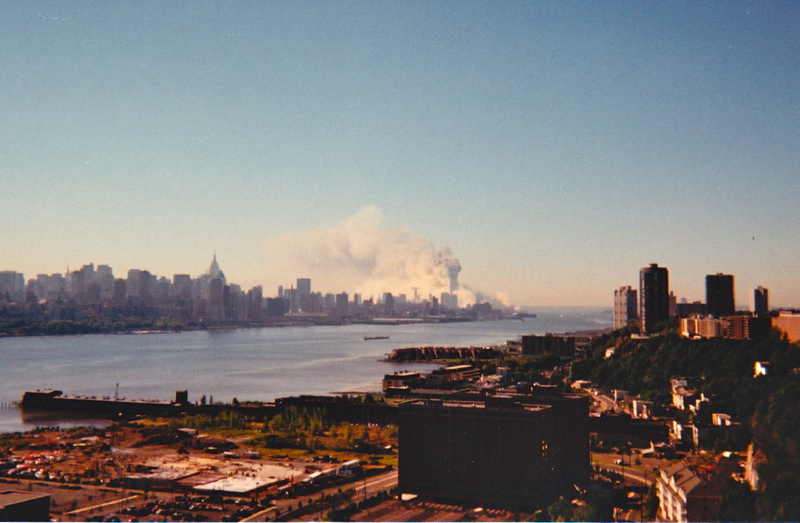 A photo taken by my father on 9/11. My first call was to my parents. They were watching the Towers from their apartment window. My father was beside himself. We had watched the Towers be built in NYC from the Jersey side. He loved them. In fact, my daughter thought my Dad owned the Towers, he talked about them so much when we drove to their apartment from Newark Airport. As for my sister, I did not get to speak to her right away. She was in the City, trying to get home. And all the cell phones were out since the Towers fell. I spoke briefly to my brother in law. He was beyond upset. His anxiety oozed through the phone lines. So I sat in my house with a neighbor, another New York area transplant. We watched the news, and over and over again watched the Towers fall. We were united in fear, until we heard that both of our sisters were safe. Then I called the high school where my daughter was a sophomore. “Are they watching this?” I asked the school secretary. “It is on in every classroom,” she told me. “I will send the note right away,” the secretary said. It wasn’t till 11 that evening that my Dad called to say everyone in my family was accounted for and safe. Not all families had such good news. 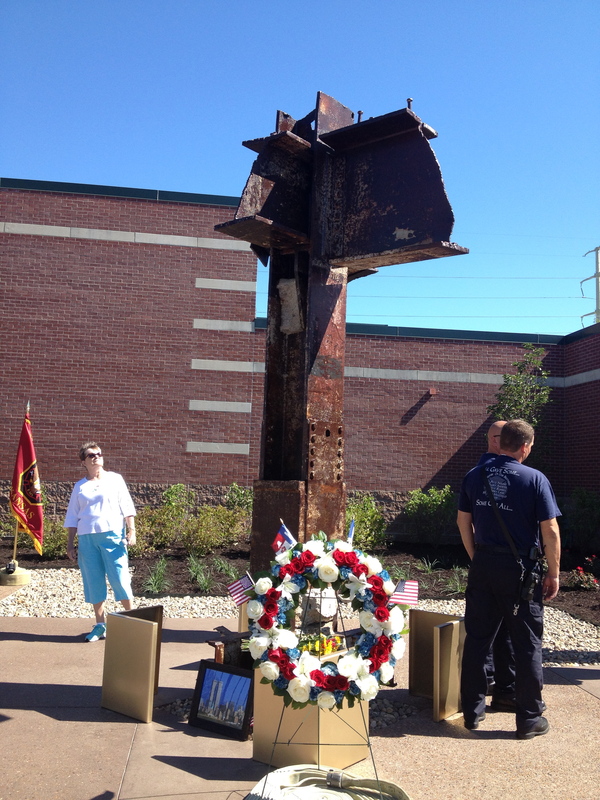 A piece of metal from the World Trade Towers in Overland Park, Kansas. In Overland Park we have a 9/11 memorial. It has a piece of a steel beam from the towers that were destroyed. 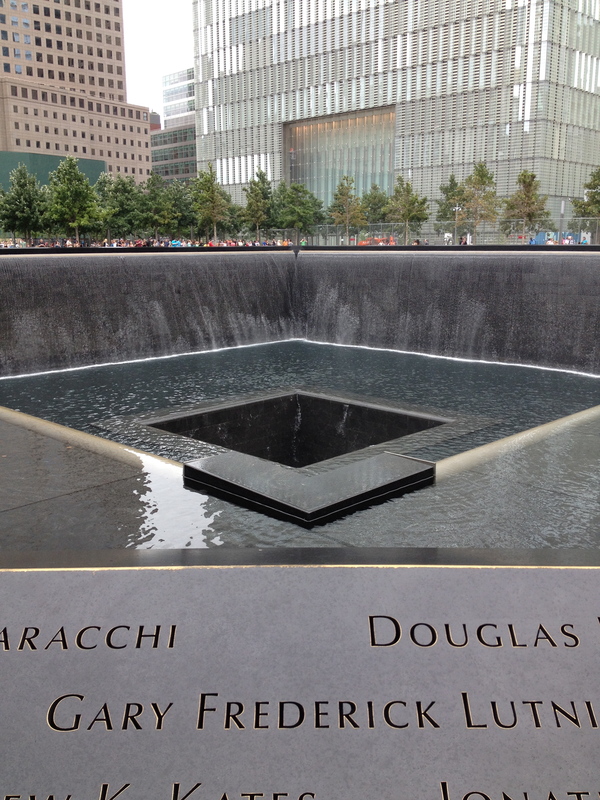 Since it opened two years ago, I go on September 11 and sit there for a while and think about my Dad and the changes in NYC and in the USA since the attacks. 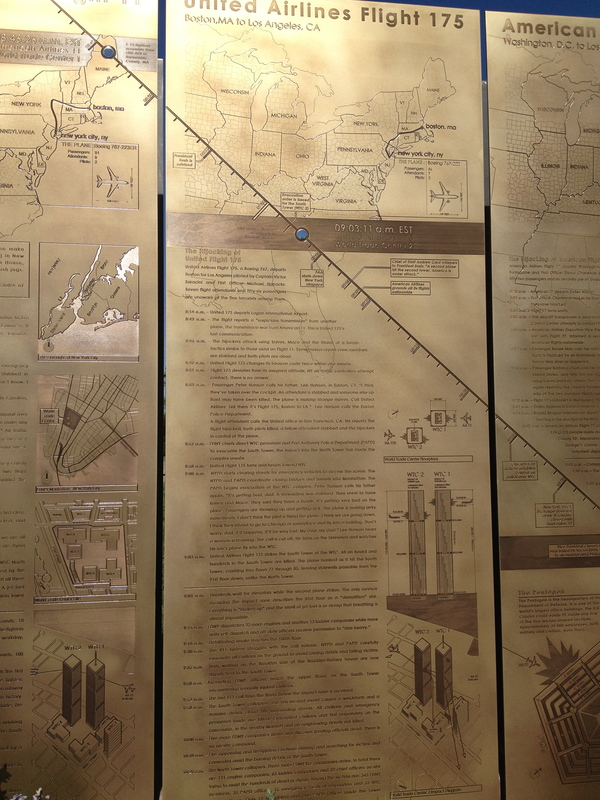 The 9/11 Memorial in Kansas tells the story. They have a ceremony there on September 11. I do not go for that. I wait till everyone is gone. Then I sit and think. I remember my Dad and his love of the Twin Towers, and I think about the changes in the world since the horrid events that day. 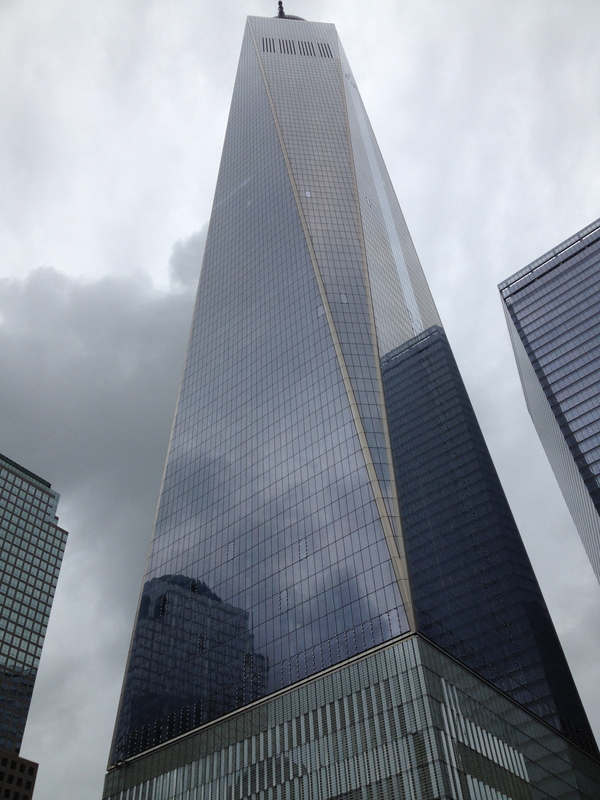 This past summer, when I made my annual visit to New Jersey and New York, I went back to the site of the towers. We have many good memories concerning the site, including eating dinner at the Windows on the World restaurant the night before my sister got married. The imprint of one of the towers. A fountain of tears. But as I looked into the giant fountains of tears, the footprints of the towers, as I read the names of those who perished, as I saw the beautiful white roses left in the names of victims, I was hushed like all the others who were there. I did go into the Memorial Museum. I went by myself. It was a mistake. I really think you need to go with someone to be able to share the sorrow. And parents, do not take young children behind the glass doors into the area that advises you not to take children in. No child needs to listen to the voices of those who no longer live or to see the videos of people falling. It was almost too much for me to bear. I did not linger in that area. As you go down, down, down into the bowels of the ground between the footprints of the towers, you can only imagine the fear of those who were there that day. It was a day like no other, leading to a world that had changed in a flash of fire. September 11 will never just be another day. While I add September 11 to days I will never forget, and I think of all those who perished, I also know that we need to stand united. There are people in the world who are filled with hatred. But I do not believe we should bend to their will. We remember what happen, but we also reach forward to life. We must, in memories of the Towers and those who perished, be candles defying darkness. As the new Freedom Tower nears completion, we know that we can bring back light. Children of today are missing out on so much fun due to parental fears and lack of neighborhood stores. But one of the most important things they are missing is the corner candy store! 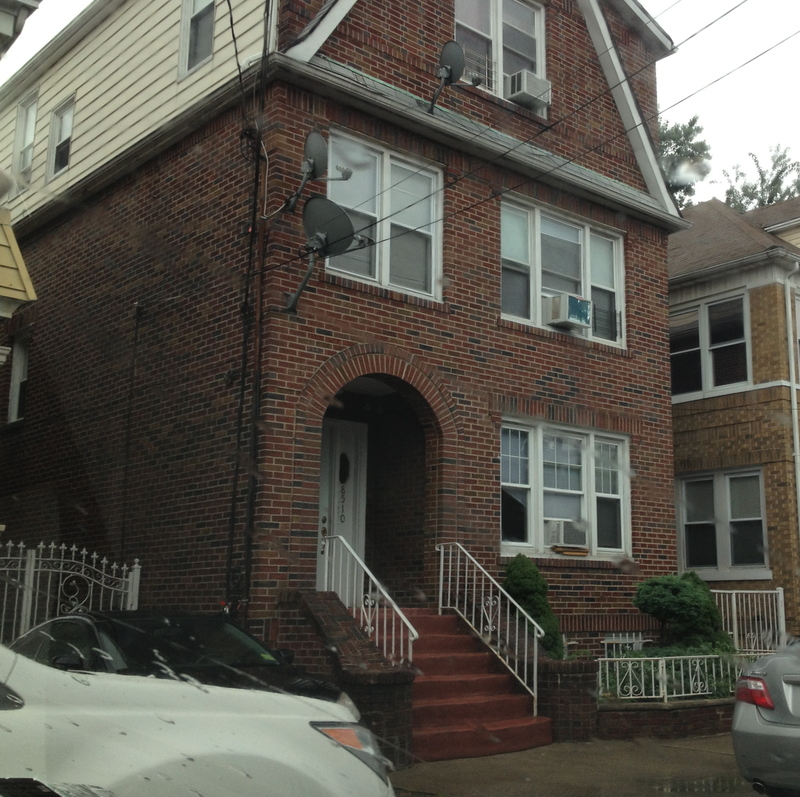 From the time I was 3 until fourth grade, I lived in a three-family home on Third Avenue in North Bergen. It was great living there, but most important the owners of the house also owned the candy store on 85th Street that I passed every day one the way to and from school. I lived on the second floor. The owners also owned the corner candy store on 85th Street. Every afternoon I stopped into the store with my treat money. You could get many different penny candies: candy buttons on a paper strip, licorice, sugar water in waxed bottles, candy necklaces and so much more. These candies bring back so many good and gooey memories. The candy necklaces would get wet and slimy around your neck as you ate off pieces of candy. The button candy on the paper was difficult to eat without eating some of the paper. One of my childhood friends remembers being yelled at by her mom for eating too much paper. Pixie Stix were a favorite. They were straws filled with flavored sugar. I delighted in eating those!! The little mini bottles of wax with the sugar water came in many colors. I liked to mush the wax into balls after drinking the water. My sister remembers eating the wax and getting into trouble for that action. She also squashed the used bottles into shapes. We had hours of fun with penny candy! An extra special part of going to that candy store was that the owners knew us so well that often they would give us some extra candy to eat on the way home. Some times they had candy behind the counter for us: items that came in with a broken wrapper or some little flaw. My sister would stand on the step stool, an old wooden milk carton, sometimes to look over the counter to see if anything was there! We would chose our candy and the store owner would put the prices on a brown paper bag and add them up to tell us what we owed. Then we would put the candy in little brown bags and snack on the rest of the walk home. We usually had enough to eat that we had some left even when we got home. When I was in third grade, I started going to religious school in the afternoons after finishing Horace Mann. Before going to the synagogue, Temple Beth Abraham, for religious school, we found the candy store a very popular spot. I always would first go to the candy store for a snack and would meet many of my friends in there also getting something to eat. We always needed a snack between school and religious school! Besides the candy, the most important part of the candy store for me was the comic books. I think every candy store had a comic book section. Each week new comic books would come out, the cost five or ten cents each. And sometimes there was a special one that cost a quarter. I loved getting the comic books. I loved browsing through them. Some of the boys loved to buy the baseball cards as well. When we moved away from Third Avenue to 78th Street, I was desolate, partly because of the lost of the candy store. But I found out I really had no worries. Even though I did not know the owner at first, I did find another corner candy store to walk pass on my way home from school. It was on either on 77 or 76 and Broadway, if I remember correctly. It also had all the penny candy and the comic books. The only thing missing was the free candy I used to get. But I did not totally miss out on free candy. My grandparents owned a bakery on Palisades Avenue in West New York. A few doors down from them was a corner candy store. Sometimes when I spent the weekend, my grandma would give me a dime and send me to the candy store….not for food. We had lots of candy and bakery goods at the bakery. But I could go buy a comic book. Yay Grandma! She knew I loved to read them. There was no candy store within easy walking to our summer home in the Catskills. Oh, wait, I take that back, when I was really little there was a small store that sold candy and ice cream across from the lake on the way to town on the corner of West Shore Road and 55. It closed when I was very young. Now there is a private home where the store used to be. But we had substitutes. We could walk into the town of Kauneonga Lake, to a small grocery store, Vassmer’s; or to the pharmacy, Newman’s. In one of those stores we could either get candy and comics, or go to the fountain at Newman’s and get ice cream or a soda. It was fun! I remember when I was a teen, I walked into Newman’s one day and there was my brother with his girlfriend having a milk shake…if I remember correctly there was one shake and two straws. Next to the Ritz Movie Theater in White Lake was a candy store as well. Before we would go into the movie, we would go to the candy store to pick out our treats. How wonderful was that? Very wonderful! Children today do not have the joy of going into a little corner store by themselves and choosing any little candy or comic. Now you have to drive to the supermarket or a convenience store. The neighborhood candy store seems to be gone forever. And I miss it! Going to a corner candy store every day was a part of the daily routine. And forget penny candy! I do not believe it exists anymore! I thnk going to the corner candy store also taught us about money. There was only so much you could spend. Would it be a comic book or candy? How much did you need to save from your allowance to get exactly what you wanted? You could plan. The candy store owners knew you! They would hold back your favorite comic, knowing what you wanted to read each week. And if you did not have enough money, they would wait till you came back. The corner candy store was a gathering place for children and adults. 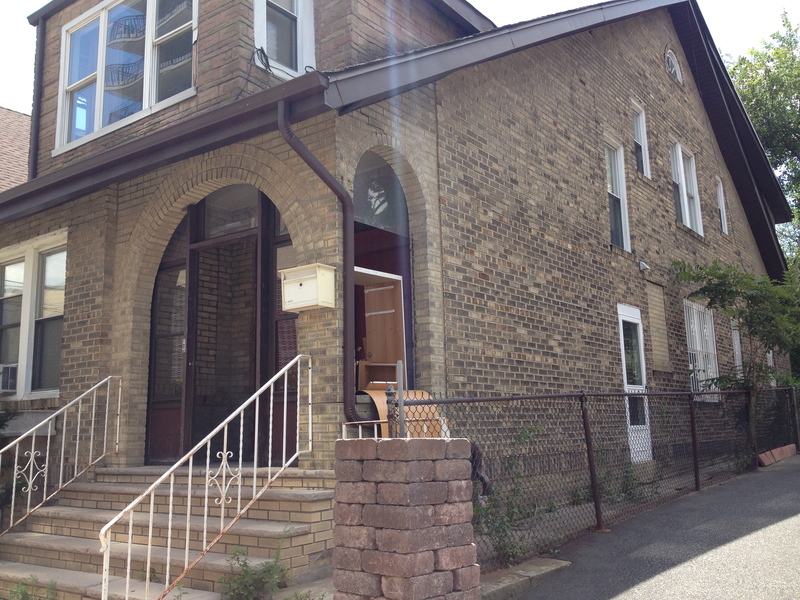 It was a community space, a place for neighbors to visit. Penny candy and comics gave us so much joy. I think that is why the corner candy store was so important in my life. What’s my Problem with Football? Plenty! Until I had a son, I never really had a problem with football. My Mom and Dad had season tickets to the Jets. Sometimes Mom and Dad went together. Other times my brother went. When my parents gave up their tickets, my brother took them over. I went to high school football games. And when I went to Mizzou, my husband and I went to almost every home game. In fact the last football game I ever went to was a game at Mizzou. It was October 1990, the game with the fifth down. It became famous. Why did I stop liking football? I think because I realized that boys don’t tell you what is going on. If they are hurt, they don’t talk about it. And I started learning about concussions and injuries, as a mom you learn about these things. It occurred to me that young boys probably don’t realize when they have a minor concussion. It isn’t till things are really bad that a parent might find out. But by then it might be too late. 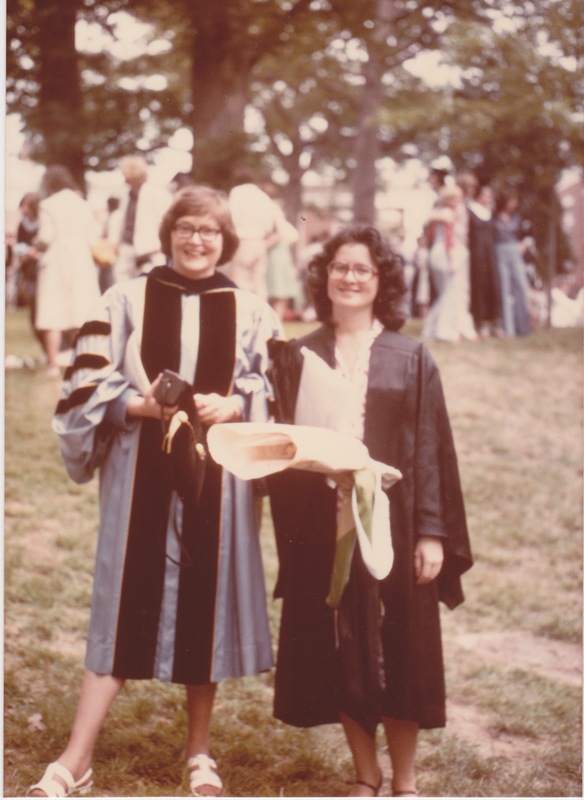 When my children were in school, I was very active in the parent organizations and school board committees. I was the president of the middle school PTA for two years. That is when my militant anti-football feeling really came out. Why were we spending tens of thousands of dollars on middle school and high school football, when we were having to fire librarians, language teachers and other important educational staff? It did not make sense to me. I even went to town hall meetings to voice my opinion on football and middle school, especially. We could save a job if we gave up middle school football. It was only offered in eighth grade, and there are many local league teams. I could not understand why schools had to have football in middle school. But I could not change the prevailing opinion. But now with all the information we have about injuries and football, I am amazed that we still have football in the public schools. When a child is injured and has multiple concussions, his ability to learn is impaired. So why are school districts supporting a program that impairs their students. However, I have noticed a change. With major league football players suing, including Gale Sayers, over brain injuries; with the wives of these players speaking out about had difficult life is for these men, I am finally hearing about parents who do not want their boys to pay football. We are even hearing about studies that the suicides and aggressive behavior of these players are linked to these brain injuries. Some people think they are helping their sons, believing they will get a college scholarship or go on to professional football and make a fortune. But what is the benefit of that if they suffer permanent brain damage. Or die young or be disabled because of the constant battering of their bodies? Then there is college football. Yes it is a big business for the colleges and their athletic departments. 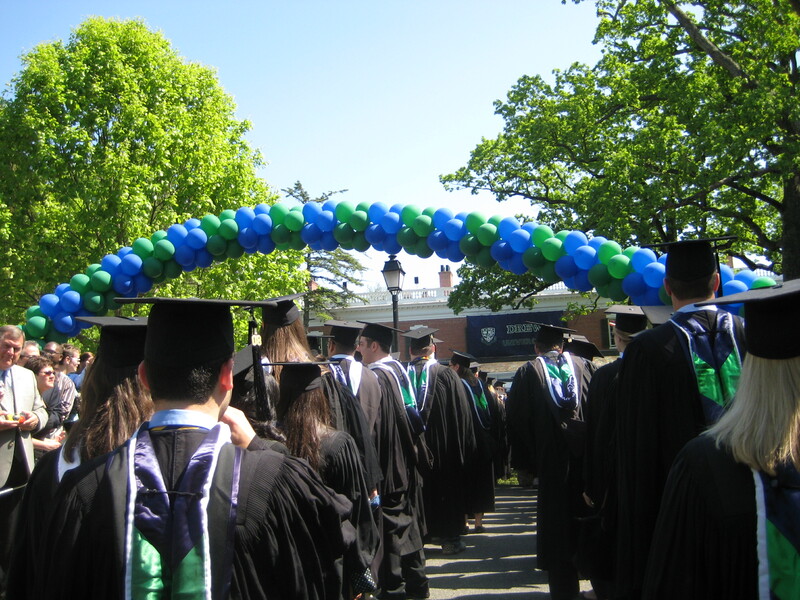 The students do not get paid; they missed lots of school; some never graduate because they have not learned anything in college. And the colleges and universities make big money and pay coaches extraordinary salaries. More than the professors get. The professors who are supposed be teaching the students. I honestly do not get it. There are the percentages… Of all the students who play middle school or high school football, only a small minority go on to college football. Of those an even smaller number go on to professional football. But how many have a fall back degree? Yes things have changed over the years. There are many more rules about education. And more rules about helmets and safety. And more rules about playing after an injury. But when you come down to it, people get hurt. I recently watched a playoff game between the Chiefs and the Colts. I thought, okay, the Chiefs are in the post-season play for the first time in 20 years. I will watch. I had to turn it off. In the end four Chiefs players and one Colts player was so badly injured they had to be removed from the game. At least two had concussions. Parents, educators, really!!! Students should be in school to learn…not to be battered.